Phillips’ autumn auctions start in few weeks. Just like in the previous auction seasons, the pieces for sale travel around the globe before the show. We had the chance to see them in London. My family has a strong habit of keeping customs. I grew up in a milieu, where celebrations meant more than shiny balloons and a like on your timeline. Although my blood flows at the speed of the 21st century, this education taught me to live up to everything that is important: to wait and prepare for these moments to come along and dedicate my attention to them. Customs create solid frames which stand firm like pillars you can always hold on to. In the past three years, Phillips’ spring and autumn auctions sled into the annual calendar and customs of many. I recently witnessed people thrilled to receive the new auction catalogue. With its regularity and consistent quality, the pillars Phillips erected seem to attract individuals at an increasing pace. They are lovers of rare timepieces, investors and a growing number of observers. The experienced vintage treasure hunters and erudite storytellers inject vivid life into this secondary market and let them hike up the prices to sometimes unrealistic heights. These emotions that fuel the collecting and the sales room shows help to grow a new fan club for fine watches in all segments. High feelings that the researching, discovering, waiting, finding, acquiring and sometimes the disappointment bring are familiar to more and more. Phillips’ success can be attributed to the fact that they could always fulfil the expectations thus far. An always carefully assembled portfolio with highlights and rarities, with always greater stories. Combining thematic and general sales routinely. Having an expert team fusing watch stories together with their own on social channels. Having one of the most charismatic auctioneers around who can tirelessly orchestrate the bidding. Visiting the previews has become a custom for us too – many times in London or Geneva. The timepieces displayed at Phillips’ headquarters will be auctioned on two thematic and one regular auction this autumn: the Winning Icons in New York (26 October), the Heuer sale, entitled “The Crosthwaite and Gavin Collection” (11 November) in Geneva and the 6th edition of the Geneva Watch Auction (11-12 November). Where else could this timepiece be auctioned than in NYC? Phillips’ home at Park Avenue is about an hour’s drive from Westport, CT, where Paul Newman lived. The piece itself is the most awaited item for sale not just this autumn, but for many years. 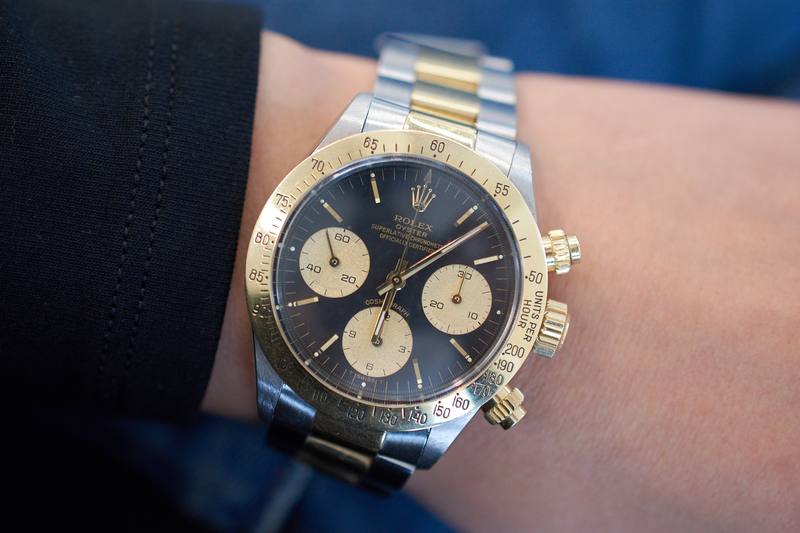 Paul Newman elevated the Rolex Daytonas (not particularly a sought after model back then) to new heights and the provenance of this very piece elevates it to beyond any Rolex seen so far. He received the steel sports watch from his wife when he kicked off his racing career. We were lucky to see it in Geneva, please find a dedicated article here. 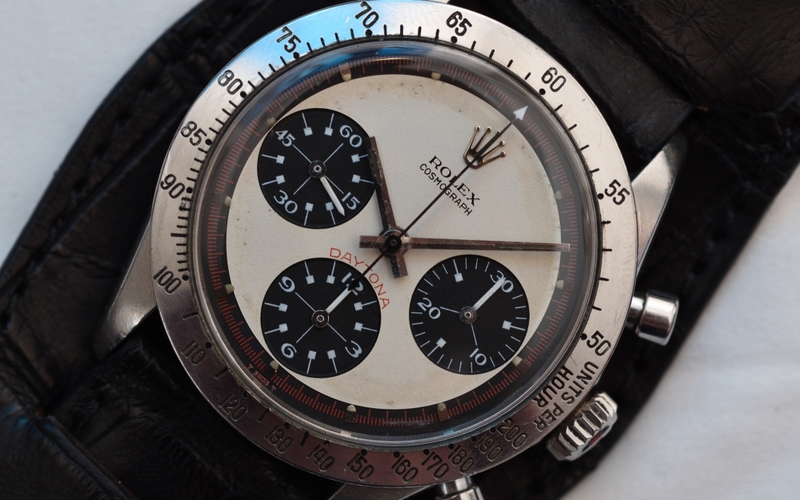 Considering its emotional value and the over-heated collector mood, this piece could well beat the sales records for any Rolex to sell at auction (which was the Rolex Ref. 6062, “Bao Dai” earlier this May). 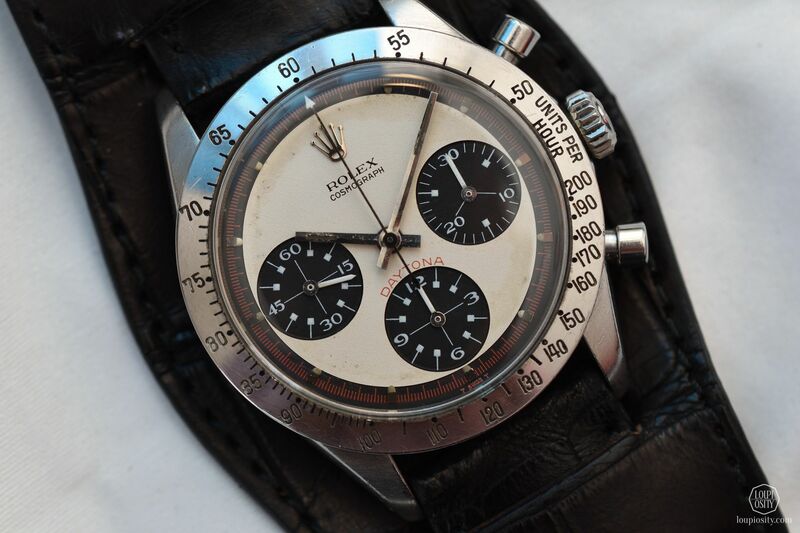 Insane as it may sound, but demonstrating the increased heat around collecting timepieces – this wristwatch could potentially get close to how much Paul Newman’s aforementioned 3.12 acre Westport, CT estate with two historic houses was on offer for 3 years ago (US $ 10m). The former 1968 model is unique due to Paul Newman’s ghost. This one from 1985 is unique, because there was no other made in this 18k gold – steel – black dial combination. It was custom made by Rolex for Bruce J. Leven, an entrepreneur and race car driver. The example is in very good condition and comes with rich literature. Cartier is an ultimate favourite of mine when it comes to design. Throughout its history, the luxury company has put down original shapes on graphite and no matter how daring they looked, craftsmen could cast it in metal and stone. Two models shone at the GWA5 this spring and from time to time you can meet their famous Crash models too at auctions. Crash first saw the sunlight in London in 1967, and it has come back in various limited editions irregularly ever since – just like this skeleton model introduced at SIHH 2016. The piece at Phillips was made roughly 20 years after the initial model debuted and it is somewhat sleeker than the original – 5mm longer and 1mm thinner, which on an oblong wristwatch is rather conspicuous. The dial and the metal have aged nicely and the mechanism is reported to be in good condition. The “London” marker is visible at 6 o’clock on the dial. Setting the time machine back with another 60 years from the former Crash model, you can witness the birth of this piece. Although their stretched dimensions are similar, the Tank Cintrée is more sober and commands authority. The platinum gives even more weight to the words it speaks, yet it feels just right on the wrist thanks to the thin curved body. The former owner’s name “Oscar C. Seebass” is engraved in the back as well as the fact that with this auction it returns to where it started its career, New York City. Inside a European Watch and Clock 9’’’ caliber supplied by LeCoultre and finished by Edmond Jaeger. 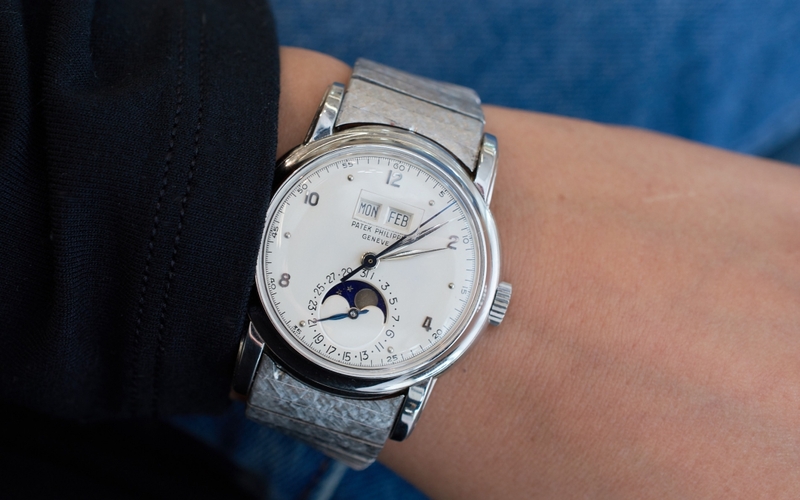 A beautiful steel time-only watch from the 40s is this Patek Philippe Ref. 565 in wonderful condition. According to the auction catalogue, the configuration that includes Breguet numerals on silvered dial and luminous blued hands is very rare and in a condition like this it is just as frequent as a unicorn. What’s more, the present example has never been at auction. Protecting from water and dust it has a screwed down case back and a snap on bezel. The movement is shielded from magnetic fields by a soft iron cage. This is easily among the best chocolates Switzerland ever produced! The square-shaped 18k pink gold case is slightly curved and the edges are softened. When you look at it from the front, the stepped lugs and bezel are fantastic. The cioccolatone design returned in many references during this period. The present Ref. 4764 model is with a triple calendar moon indication provided by the manual P485 movement. We covered another model – without a calendar – here. I remember when I first saw the the Oyster Perpetual Datejust Pearlmasters from Rolex at Baselworld in 2015 and 2014. Those pieces are so divisive that people’s reactions were very digital – either 0 or 1, there was nothing in between. No doubt, these versions look overwhelming especially for some hard-core Rolex fans. Nevertheless, these pieces are true testimonies of Rolex’s inexorable commitment to gemstone and gem-setting qualities. The play of colours on the rainbow bended on the bezel and the diamond pave on the dial deserve an honest nod from everyone. The present lot is one of the first messengers by Rolex from 1986. Sapphires and rubies (hence the name SARU) and diamonds float on the 18k yellow gold lake. 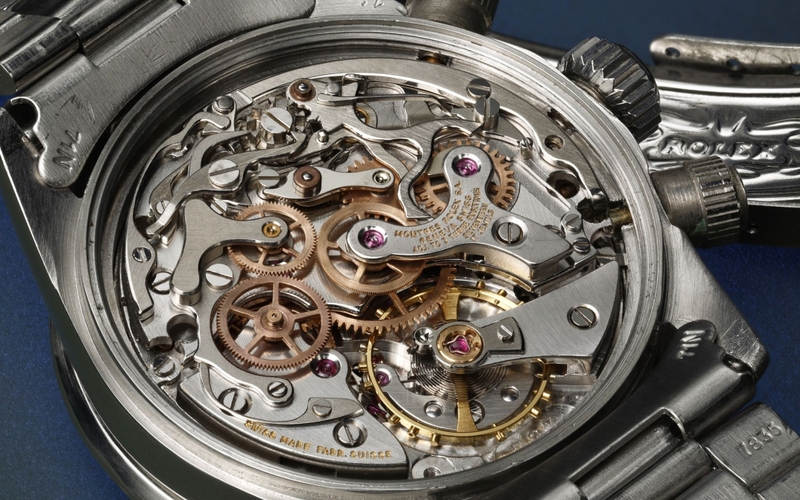 The qualities of the setting and the condition of the entire watch are unbelievable. The Winning Icons auction include 50 pieces altogether. It will be held in Phillips’ Hew York HQ at 450 Park Avenue, on 26 October 2017. Tune in for the broadcast online. Phillips Geneva Watch Auction: Six Phillips Geneva Watch Auction: SIX is 11-12 November in Geneva. The two days will include three sales events: two sessions and an exceptional Heuer chronograph sale from the Crosthwaite & Gavin Collection.